We are still open for more participants. This entry was posted in Uncategorized on 04/02/2019 by astarotheatro. We need to go beyond the banality of borders. Borders do not create anything. Borders destroy. What we want is creation, because creating is life itself. It is as fundamental as the air we breathe. Migration is as old as mankind. Today, however, the migration has been politicised. The guardians of the borders have turned migration into a tool used to spread hate, intolerance, dissociation, social unrest and insecurity. It’s an increasingly effective way to divide people. More than the good old ‘divide et impera,’ the current form of migration is used to separating people socially and humanly. To understand this dangerous political agenda is to see how it undermines our politics, and our humanity. We’ve chosen to name our project Riace so as to pay homage to the Southern Italian’s town homonymous ‘Riace Model.’ That model refers to how this small town became a safe haven for hundreds of migrants by promoting an integrated way of life and sustainable coexistence with the local population. We believe the arts need to engage society; they need to represent today’s turmoil. Moreover, we acknowledge the cathartic function of the arts, and we are aware of arts’ potential as a means of raising awareness. Words, sounds, images need to transcend the fixity of our everyday and provoke the audience into rising above the level of the given to that of the possible. Through this process, the uselessness of borders is made evident, giving way to the human necessity found in peaceful coexistence. To this end we come together as migrants, political refugees and locals in order to create a performance: an act of theatre, poetry, music, performance art, choreography. And an act of activism, of human and political togetherness. Although most of the participants are not professional artists, their performance will be one of artistic character, containing human and political meaning. Although similar works are regularly performed in other countries, projects such as this one are seldom seen in the Netherlands. Hence our artistic intervention. It’s time to stop seeing the migrant as ‘problematic’ or ‘troublesome.’ It’s time to go beyond the politics of social segregation as mass distraction. Our performance seeks to transcend the political pitfalls of discrimination and hate peculiar to our present and confused world. We want our performance to be a safe haven, a place where diversity is richness and discrimination can only vanish. Our performance is our Riace. This entry was posted in Uncategorized on 26/12/2018 by astarotheatro. This entry was posted in Uncategorized on 20/12/2018 by astarotheatro. 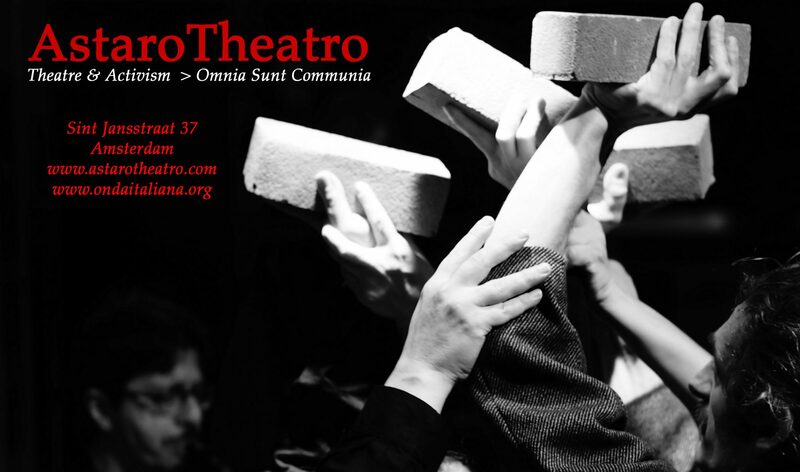 AstaroTheatro presents a monologue by Howard Zinn adapted and performed by Roberto Bacchilega at IIRE during the annual International Youth School. Karl Marx has had enough of seeing his revolution taken over by opportunists organizing each time a new priesthood and a new hierarchy, with excommunications and indexes, with inquisitions and firing squads. He is disgusted by media declaring him dead again and again. Karl Marx is back to remind us that his ideas are more alive than ever. He revisits memories of his courageous life and revolutionary theories. We learn about his family, his struggles and the boils on his arse. This entry was posted in Uncategorized on 20/11/2018 by astarotheatro. This entry was posted in Uncategorized on 06/11/2018 by astarotheatro.